In 2012, crowdfunding platforms raised more than $2.7 billion and successfully funded more 1 million campaigns. With projected industry volume of $5.1 billion in 2013, the stage is set for explosive growth in this infant industry. 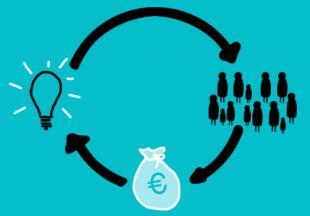 What influence has crowdfunding had on our society and how will it continue to change society? Far from the raw numbers and statistics, the heart of crowdfunding lies in the hands of the individual, whose contributions inspire innovation, support, and growth. The most profound benefit of crowdfunding to society are the endless possibilities that exist due to the ease of matching donors and recipients. From small business startups all the way to scientific endeavors, it has never been more efficient to raise money to pursue an idea. For example, Planetary Resource completely crowdfunded the ambitious ARKYD project, which aims to put the first publicly accessible telescope in space with the ability to take pictures and display an image of yourself above earth. Crowdfunding has enormous potential to redefine education in a time when school and community budgets are tight. Teachers can raise money for class projects and field trips. Parents and other members of a community can contribute funds for projects that enrich and build a positive environment for younger generations. Platforms like Instagrad allow college students to crowdfund their student loans. Other companies like PiggyBackr, aimed directly at teaching kids about fundraising and giving them opportunities, help to raise money for projects, teams, or causes. The recent passage of the JOBS (Jumpstart Our Business Startups) Act on April 5, 2012 has paved the way for internet crowdfunding, early-stage investment and fundraising for businesses. Now anyone can have access to investing in startups, which signals huge potential for capital movements, business creation, and job opportunities over the next few years as this market picks up. Ever have a desire to donate to a meaningful charitable outlet but don’t know where to look? Crowdfunding not only provides a way for donors to access and browse a wide range of causes and charities on crowdfunding sites, it also provides a new funding source for nonprofits. As public funding and endowments dry up, crowdfunding presents a new fundraising medium, one which allows nonprofits a greater opportunity to share their story with videos, personal stories and images. As humans we are driven to interact and cultivate relationships. When we see someone asking for money for their garageband to make a demo, a single parent family going through a tough transitional time, or a family dog recovering from surgery, we naturally feel a need to connect and contribute to their causes. Crowdfunding sites are simple to use and require very little setup, allowing more individuals to get the word out quickly about their needs. Sometimes even the “impersonal world” of the internet can create positive change. Almost anywhere you look on the internet new crowdfunding sites are popping up daily, hoping to secure a foothold in this new industry. It has never been easier to find a project to fund or set up an account to fundraise for an idea of your own. Ready to get started using crowdfuding now? Check out our crowdfunding bundle for tips on how to design your campaign and win backers. What projects have you contributed to and why? Share your stories in the comments!